Instead of playing together in the streets, many children today play video games aimed at recruiting them into the armed services. “Millions of Syrian children . . . are suffering because of adult people,” wrote seven-year-old Syrian refugee Bana Alabed in an open letter to US president Donald Trump. Having fled with her family from their besieged hometown of Aleppo (in Bana’s words, “the city of death”), she found refuge in Turkey. But “some of my friends died,” Bana wrote in her January 2017 letter. War and the military-industrial complex—the mutually beneficial alliance between the military and those industries that produce arms and other military materials and technologies—are indeed largely the domain of adults, with children often the innocent victims. Within that complex, however, one aspect is an exception and warrants closer attention: the military-entertainment complex. Well before they are of legal age to join the armed forces, young people around the world are actively taught how to war by playing true-to-life military video games. Thus war could become—for new recruits, though of course not for their victims—little more than virtual reality. What kind of future can we look forward to if war becomes indistinguishable from a game to those brandishing the weapons? Over the course of centuries much has been written about weapons and warfare and about their pursuit in the interest of national defense. The military-entertainment complex has become part of the discussion only recently with the advent of military-inspired video games. Designed to recruit young people and train soldiers, such games stem from the combined efforts of the military, the video-game industry and the movie industry. It may at first seem an odd mix, but “media and history of technology scholars have carefully documented the points of convergence between the U.S. military, private technology firms, and entertainment companies in the production matrix known as the ‘military-entertainment complex’ that coalesced during the post-Cold War years” (Joystick Soldiers: The Politics of Play in Military Video Games). 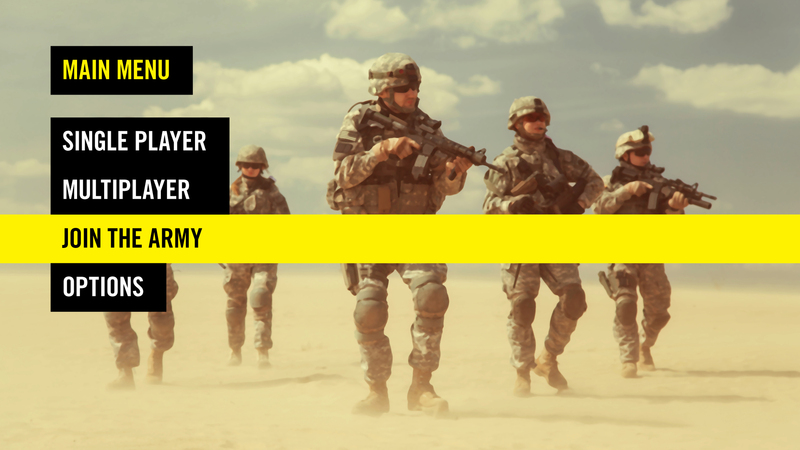 One of its key tools in the United States is America’s Army, labeled “the Official Game of the U.S. Army.” According to a January 18, 2017, tweet by the US Army Recruiting Command, America’s Army “spreads the #ArmyValues & message, gaining the interest of potential recruits.” This is consistent with the vision of Colonel Casey Wardynski, the military official behind the game’s creation. Researcher Corey Mead points out that, according to Wardynski, “America’s Army was explicitly designed to target twelve- and thirteen-year-old boys . . . who had yet to decide what to do with their lives.” The game is free and promotes the army’s values and message through actual gameplay; but in addition, notes Clifford Kyle Jones in an article on the US Army website, “during loading screens, [America’s Army] plays Army marketing videos, and . . . two million views of those messages are seen each month.” As a teenager plays the game repeatedly, perhaps over the course of several years, the army’s values and message become ingrained, motivating the “potential recruit” to seriously consider enlisting by the time he or she is of age. The goal of any army throughout history has, of course, been to use “as much violence as it takes” to defeat the enemy. And whatever the justifications may be for waging any war, the reality is that “millions of Syrian [and other] children . . . are suffering because of adult people.” Many of those adults have been taught—while little more than children themselves—to be violent and wage war vicariously through video games. Instead of playing outside in the streets, these young people sit inside and interactively learn war and violence in front of a screen. The suffering of millions in war-torn areas of the world stems, at least in part, from lessons learned in video games like America’s Army and then implemented in real life. Is the military-entertainment complex sustainable? Or is it just leading us down a path of increasingly sophisticated ways to wage war and ultimately destroy one another? In a classic piece of Middle Eastern literature—in a passage from the biblical book of Isaiah—the prophet declares that at a point in the future, violence and war will be eradicated. It is the hope of the nations, inscribed outside the United Nations in New York: “They shall beat their swords into plowshares, and their spears into pruning hooks; nation shall not lift up sword against nation, neither shall they learn war anymore” (Isaiah 2:4, emphasis added). Sadly, before that time, another prophecy tells us that humanity will be faced with such an overwhelming catastrophic threat that, “unless those days were shortened, no flesh would be saved” (Matthew 24:22). The Middle East has been at the center of major conflicts throughout history. We read in the Bible of Syria’s capital, Damascus, and of Jerusalem, ancient cities beset by war and violence. But in contrast to this, and to Aleppo, today a “city of death,” Jerusalem serves as a symbol for the cities of the future, a beautifully restored city of life. Safety and security will be its hallmarks. Another prophet writes, “Old men and old women shall again sit in the streets of Jerusalem, each one with his staff in his hand because of great age. The streets of the city shall be full of boys and girls playing [outside] in its streets” (Zechariah 8:4–5)—not inside playing military video games. That peaceful age, totally absent war and violence, sounds like a time that Bana Alabed—and indeed all of us—can really look forward to. Nina B. Huntemann and Matthew Thomas Payne (editors), Joystick Soldiers: The Politics of Play in Military Video Games (2009, 2010). Clifford Kyle Jones, “Game Studio Keeps Army Outreach, Education High-Tech” at army.mil (January 13, 2017). Corey Mead, War Play: Video Games and the Future of Armed Conflict (2013).